In the world of fashion, throughout history, the designers at the helm of the major houses have traditionally been men, Dior, Givenchy, Saint Laurent, Lagerfeld and Poiret to name a few. However, when it comes to the critique, dissemination and indeed publication of fashion ideas, Women have more often led the way, Diana Vreeland, Liz Tilberis, Anna Wintour, Lorraine Candy and of course Alexandra Schulman. So, Conde Nast’s appointment of Edward Enninful, the Ghanaian born, London raised Super Stylist and Fashion Director of both ID and W magazines is perhaps and more so hopefully a sign that things may be about to change. A powerful advocate of issues surrounding the lack of Diversity within the fashion industry, Enninful has throughout his long career championed the faces of black Britain and of course around the world. 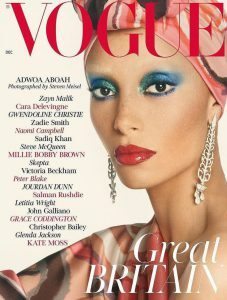 Vogue as we knew it has often been criticised for an almost total lack of women of colour as cover stars. Enninfuls global perspective can only prove to light a fire under what he has himself refefed to as the complete ‘white out’ of western fashion. Stylist and friend of some of the most influential female black models, artists and stars such as Rhianna, Jourdan Dunn, Naomi Campbell and Joan Smalls, Enninful has been responsible for many of the most striking and influential campaigns of the last few decades featuring a diverse range of models colours and creeds. The recently released film ‘I am an Immigrant’ by Kloss Films which Enninful was creative director was a powerful indication of the range of influencers that Enninful can bring together into one studio during NYC fashion week and combine to send out a powerful and stylish political fashion message to the world. 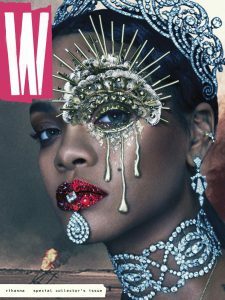 It is also this level of mastery of the rapidly advancing and experiential world of Digital Fashion Communication which in combination with the powerful print imagery that Enninful is also world renowned for which will see the fortunes of Vogue in re-ascendance. Enninful has commissioned and creatively directed fashion films both during his tenure at London’s I-D and as Fashion Director of W in New York often collaborating with Kloss Films one of fashions leading film exponents. This embracing of the contemporary fashion sphere and Enninfuls knack of seeing the world in his distinctive way is what will inspire the next generation of fashion movers and shakers. Fashion Publishing is ready for a shake up and Enninfuls appointment as surprising as it has been hailed certainly opens the door to change. At the end of the day if fashion is about one thing then change is it. Enninfuls appointment is not merely about the diversity question though, fashion publishing has been written off in recent times as a victim of the emergence of digital rapidity. Images and text are available and circulated in real time and the consumer is flooded with new influences, trends and fashion fripperies at every turn. However, the backlash has begun with creatives and fashionistas in all fields craving the smell of ink on paper and the tactile publishing experience in their hand. It seems timely then that a fashion editor and director such as Enninful has come centre stage. He is world renowned for creating striking and provocative imagery using epic themes and visualising the women he casts as powerful and commanding heroines and Super beings! Enninful uses fashion as a tool for empowerment and celebrates the strength and sexuality of the women in his work. In many ways Enninfuls return to the UK is the closure of a very fashionable circle, from being spotted by super stylist Simon Foxton riding the tube in the 80’S and beginning a career as a model, through his catalogue of work at I-D onto stints at both American and Italian Vogue, indeed directing the first ever all black issue, to W in New York and now back to what can be considered as the London fashion industry’s Top Spot. Buy a single issue of the current issue, or a subscription and never miss out on an issue. By Chris Hodge, Senior Lecturer at Northumbria School of Design.